At the Cloud Appreciation Society, we don’t like to claim one cloud is better than another. But some clouds are undeniably rarer, making them seem a little more special. One of the rarest of all is the ‘horseshoe vortex cloud’. 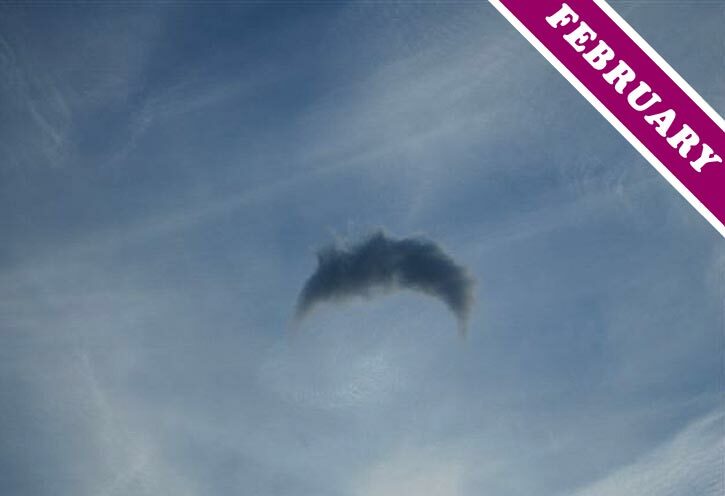 In fact, of the 2,200 or so images on our cloud photo gallery to date, only two feature this elusive formation. The fine example above appeared over Jasper, Alberta, Canada (the other one is here). This cloud forms in a region of rotating air, or vortex. Such vortices usually form vertically, sometimes leading to waterspouts or even tornados, but occasionally they can develop with a horizontal axis and give rise to a gently rotating crescent of cloud. Such a movement of air seems to happen when an updraught is sent into a spin upon reaching shearing horizontal winds. Rarely are conditions right for a cloud to appear within the spin. Some say that a horseshoe brings luck only when it is pointing upwards and holding the luck in. Others claim that, when pointing down, it allows luck to fall onto those below. Horseshoe vortex clouds tend to point downwards and so any cloudspotters already fortunate enough to see one will want to stand below it to top up on their luck. Could it be possible that horseshoe vortex clouds are rarely seen, not because they are rare, but because they only last about 10 seconds? I see them frequently when skiing at Alta, Utah in the winter and in the summer in northern Arizona. Whatever…great cloud pic…and if they are frequent but fast…and we are not…how amazing is that? !